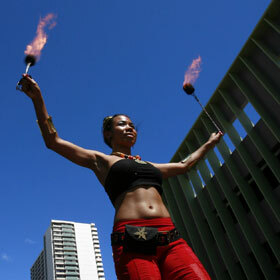 PHOTO FINISH » Anna Morgan performed fire poi while modeling fashion from Bad Sushi at the F.A.C.E. (Fashion, Arts, Cuisine, Entertainment) of Nuuanu Avenue fashion event held Saturday. Two 1850s-era churches remain closed due to damage, while a third is slated for demolition. Fire crews recover a boy who perished while snorkeling off Kaaawa Beach Park. Officials are working with community advocates to educate and support prisoners with hepatitis B and C.
HIFF's 2007 season offers some tasty developments. The quality of UH's opponents results in a lower rating than in other polls. Scott Matsumoto got a career green light when he became an electrician with the city. The Board of Education has chosen a 24-year veteran to direct Hawaii's library system. The Ironman triathlon brewed a pot of trouble when it introduced a non-native species in Hawaii's premium bean district.